Recently while visiting the library, I noticed a book standing upright on a shelf as I passed by the children’s section. As a lover of books, including children’s books, I picked it up and looked through it, deciding to take it home. Having just recently read the Velveteen Rabbit with my 12 year old girl one afternoon (for the umpteenth time but not in a very long while), I thought perhaps we might enjoy reading this together. I knew it would be either a hit or an “epic” miss. To my delight and both our joy, we have been reading through with tears of laughter and utter enjoyment what is called the Toy Trilogy by Emily Jenkins. Although this story and series is for the age range of 7-10, it is one of those magical and timeless stories that can be enjoyed by everyone and will be a treasured classic to be re-read again and again. My daughter already made me re-read certain parts that were especially amusing! The characters are memorable and distinct in their personalities. The adventures and experiences they have are entertaining and hilarious. These three best loved toys of a young girl share many misadventures and a few messy moments along the way as they live their daily lives. Rich in laugh out loud outbursts, flashbacks to elementary days and childhood memories lessons, I just can’t say enough good stuff about these books except- Just read them. Recommended, in my opinion for children of ALL ages. Mother and Daughter give them a four thumbs up, and 5 stars for on the couch read aloud time! 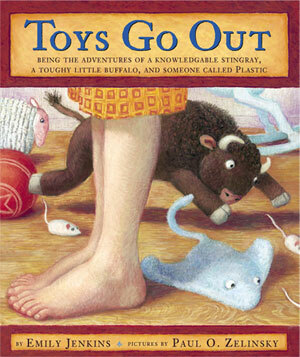 Black and white pencil drawings accompany these adorable toy adventures by award winning illustrator Paul O. Zelinsky. Below are the links to each of these books through Random House Kids where you can see the books for yourself with a handy gadget like the one below! Also if you click on the gadget below it will open in a larger screen so you can take a peek!